Our program places an emphasis on high quality child care and early educational experiences. 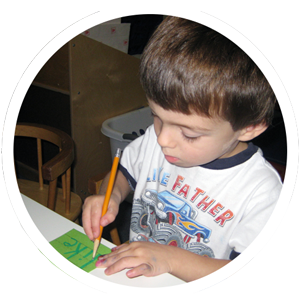 The curriculum is age-appropriate and designed to grow with infants, toddlers, and preschoolers. DCDC’s has the only centers in Montour County that are accredited by the National Association for the Education of Young Children. 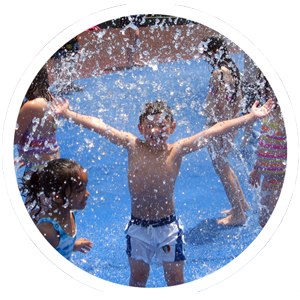 Both sites are Keystone Stars STAR 4 Accredited sites with Preschool Programs licensed by the PA Department of Education. Our main campus on Wall St provides care for infants, toddlers, and preschool with full and part time contracts available. DCDC’s second site, located on Bloom Road, provides a concentrated four hour preschool program running from September to May, along with care provided to our school-aged children for before and after-school, delays, early dismissals, school closings, holidays and our full day summer camp program. Our primary goal is the comfort and well-being of you and your child. In order to facilitate that, we offer tours of our Center to prospective families, as well as the opportunity for parents and children to visit with their child’s group prior to enrollment. After enrollment, parents are welcome to visit the Center anytime. 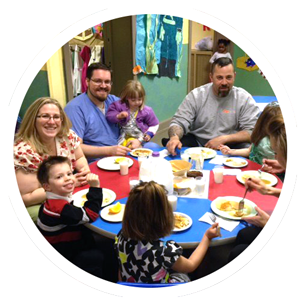 DCDC serves breakfast, lunch, and a snack to children enrolled at the Center. School-aged children are served breakfast and snack, with lunch provided by the parent during full days. 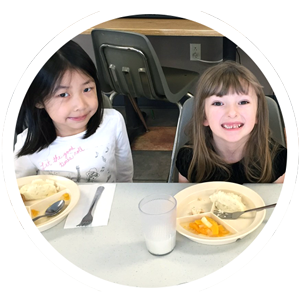 All of our meals are nutritionally based, and DCDC participates in the Department of Education’s food program. Menus are provided for parents to take home. Our groups often extend their learning by exploring our community through field trips. Preschoolers either venture out into the local community or community neighbors are welcomed into the program to share their knowledge and experiences with our children. Parent volunteers are encouraged and welcome to come along, with proper clearances and even to share their experiences and/or cultural background. Strong communication between teachers and parents is especially critical in childcare. Here at DCDC we use the Brightwheel App. Our teachers will complete a daily report for infants, toddlers, and preschoolers that parents can view right on their smartphones. These reports are intended to provide an easy way to ensure important information is being shared on a daily basis. The reports discuss such things as what your child ate at mealtimes, how they napped, diaper/bathroom habits, and a personal message to you about your child’s day. Parents and teachers are able to message each other to keep up to date on their child’s progress. Our staff works hard at establishing good rapport with the families of children in their class. “Getting to Know You” meetings are held within the first few weeks of enrollment. Also Center Adjustment Reports are shared between the teachers and parents each time a child transitions between classrooms, so the teacher and parents can establish a solid relationship. Conferences are offered twice a year, in the Fall and Spring. 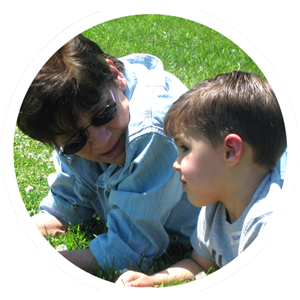 Throughout the year developmental assessments of your child are completed using the OUNCE for Infants and Toddlers and the Work Sampling for Preschoolers, these are reviewed with the family as well as other relevant work. Conferences are a good time for parents and teachers to discuss your child’s development, and for the teacher to gather information that will help him or her to support you as the parent. Teachers are also available on an as-needed basis whenever you have a question or concern. DCDC has tuition assistance available. The Educational Improvement Tax Credit program offers tuition assistance specifically for pre-kindergarten children whose families meet certain income guidelines. The funding will help offset the cost for children from age three to five to attend DCDC’s preschool program either three or five days per week. This funding is available thanks to corporate support through the Pennsylvania Educational Improvement Tax Credit (EITC) program. In past years DCDC’s scholarship fund has received support from PPL Corporation, Highmark, Keystone Insurers Group, Cole Hardware, First Keystone Bank and FNB Bank. Additionally, DCDC offers tuition assistance for all age groups through its United Way funding. DCDC also accepts Child Care Works, Subsidy, through Early Learning Resource Centers (ELRC) and Child Care Aware of America (CCA of A) military fee assistance. Events scheduled throughout the year specifically aimed for our families include: Fall Family Fun Night, Parent Breakfasts, Family Carnival, Parent Workshops, and Book Fairs. We are proud of these special events and offer them as an “extra” to our families. Danville Child Development Center’s Infant Program is designed to provide a warm, nurturing, and stimulating environment for our youngest learners. Our teachers provide each child with opportunities for discovery and skill development, taking their cues from the children’s interests and individual progress. Infant Program teachers are first-rate caregivers, recognizing that infants need plenty of snuggle time throughout the day. Parents are our teacher’s partners as we work to create a plan for each child that best fits their needs. Parental input is the vital link that allows us to adapt our program to better serve the children in our care. It is important to us that parents feel as welcome and comfortable in our program as their children do! Toddlers are so busy growing and learning new skills! Our toddler classrooms are exciting places to be. 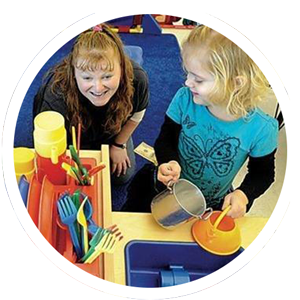 The toddler teachers plan a variety of hands-on activities that encourage the children’s budding self-help skills and independence (“I can do it myself!” is a toddler’s creed!). Our toddlers enjoy ample time to express themselves when participating in art activities, singing, dancing, building, and pretending in our many learning centers. 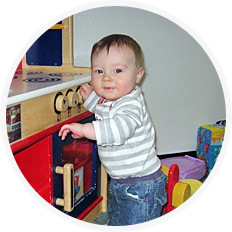 Teachers encourage toddlers´ new social awareness by modeling turn-taking and encouraging beginning attempts of toy sharing and cooperative play. Teachers work to create a bond with each child and family, as it is important for both the children and parents to feel a sense of belonging in the classroom. DCDC’s offers two licensed Preschool Programs. Our full-day year-round preschool is offered at our main campus on Wall Street, and four hour per day school year program is located at our Bloom Road site. Preschoolers possess a curiosity and willingness to learn that makes planning engaging, thought provoking, and enjoyable lessons a delight for our preschool teachers. Teachers, who hold a Bachelor’s degree in Early Childhood Education, or Elementary Education and their Nursery School Teaching Certificates, lead all our preschool classrooms. These teachers believe that children learn the most when involved in hands-on, meaningful activities. In preschool, the children have the occasion to refine the self-help skills they learned as toddlers, as well as to further develop other school readiness skills that will help them throughout their school careers. Our teachers offer the chance to develop skills across all of the learning areas: arts and science, math, language and literacy through participation in learning stations that are based on the children’s interests. In addition, the staff encourages the enhancement of each child’s social skills, including choice making, negotiation, and conflict resolutions by assisting the children as they talk through differences with their classmates. DCDC has scholarship funding available for pre-kindergarten children whose families meet certain income guidelines. The funding will help offset the cost for children from age three to five to attend DCDC’s preschool program either three or five days per week. The funding is available thanks to corporate support through the Pennsylvania Educational Improvement Tax Credit (EITC) program through PA’s Department of Community and Economic Development. In the past year DCDC’s scholarship fund has received support from PPL Corporation, Highmark, Keystone Insurers Group, Cole Hardware, First Keystone Bank and FNB Bank.